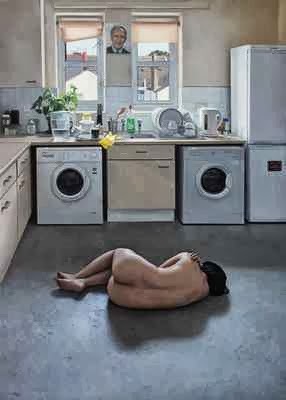 Having carped about the judges and wannabees in this year's Threadneedle Prize exhibition, I thought I'd show you the one absolutely brilliant entry I spotted: Surrender (2012) by Raoof Haghighi. This is photo realism at its very best. Yes, folks, it's an oil painting! Its price tag is £10,000. I also picked another of Raoof's paintings in last year's show: Vicky (CLICK). Once again he failed to make the shortlist, because the judges aren't seeking great paintings or sculptures; they want to bamboozle us with rubbish they can foist on us as innovative art. In 2011 Raoof was awarded Artist of the Year by Artists & Illustrators magazine for his painting Roya (CLICK). That's a genuine accolade. He hails from Iran - a good country to get the hell out of - and lives in London. CLICK to visit his Facebook page.